Understanding the fundamentals of carbon fiber is very beneficial to engineering FRP structure reinforcement and strengthening applications. These are very high strength fibers used in fiber reinforced plastics (FRPs). Carbon FRP, or CFRP, has a significant role in structure strengthening applications and will no doubt become more popular in its use as original, internal reinforcement. This page describes the source of carbon based fiber, an explanation of the different qualities of fiber manufactured, the mechanical properties of each fiber type, and the difference between "carbon" and "graphite" fibers. Carbon fiber is produced from a petroleum pitch, rayon, or polyacrylonitrile (PAN) precursor filaments. Of these, PAN-based fiber is the predominate precursor used in CFRP for structural reinforcement and strengthening due to its resulting high quality and strength characteristics. The process of making PAN-based fibers starts with acrylonitrile, a monomer, which is a yellowish liquid with the chemical formula C3H3N. It’s basically a vinyl with a nitrile attached to it. Acrylonitrile is copolymerized with another monomer to form the polymer polyacrylonitrile (PAN) resin. The PAN precursor is spun and stretched into acrylic fibers, orienting the polymer molecules and then oxidized at 200 °C to 300 °C. The fibers are then carbonized by heating in an inert gas atmosphere under tension to temperatures between 1,500 °C and 2,000 °C for high strength fibers and up to 2,500 °C for high modulus fibers. After carbonization, the filaments are sized and given a surface treatment to allow them to bond well to matrix resin in a future FRP. 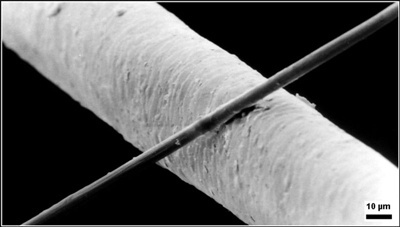 Manufacture of PAN-based fibers results in a fiber that is about 94% carbon atoms. Carbon fibers are essentially ribbons of carbon atoms oriented in the long direction of the fiber and through the manufacturing process become folded in a crimped or hairpin fashion. 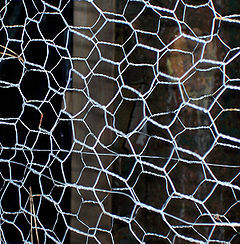 If you could see carbon filaments on a molecular scale, they might look like a length of scrunched up chicken wire. Chicken wire fencing has a similar hexagonal pattern that carbon atoms form when bonded together in long ribbons. This spring I’ll probably have to buy a short chicken wire fence to keep the rabbits out of my daughter’s vegetable garden. If I were to take a long length of that 20-inch (0.5 m) tall fence and fold it in half length-wise, then again so it’s the same length but it’s only one-quarter the height, then folded and scrunched it in a random way to as thin a size as, say, my wrist, that would be similar to the structure of a carbon filament 50,000 times larger than the real thing, except that the filaments use many, many layers (ribbons) of carbon that are all folded and scrunched together. The folds do not allow the ribbons of carbon to slide past each other. These interconnected and folded carbon ribbons give carbon-based fibers their great strength. Carbon fiber made from PAN precursor have a diameter of 5 to 7 microns, about 10 times thinner than a human hair. The filaments are produced and wound onto bobbins in groups called tows. “Tow” is a synonym in the textile industry to “roving” which is simply a parallel group of untwisted filaments. Carbon fiber tows generally contain between 3,000 and 60,000 filaments each. The number of filaments in a tow is reported in the industry by its thousand, or K value. For example, a 12K carbon tow has 12,000 carbon filaments in a tow. The desired characteristics of the end product determines which size carbon tow to use. A product, say a carbon textile, weaved with 24K tows will have a lighter weight and less tensile strength than a product using 48K tows. CFRPs used in structural reinforcement generally use large tows (greater than 40K) because they are generally applied to consistent and uniform surfaces (as externally applied) or formed in straight sections (as pultruded reinforcing bar or plate). Carbon fiber has the widest range of strength and stiffness than all other fibers used in structural FRPs. Carbon filament is grouped into categories based on its modulus of elasticity. The classification names are: low, standard, intermediate, high, and ultra-high modulus. There is no testing standard related to carbon filament classification therefor the elastic modulus values for each class vary from manufacturer to manufacturer. Even though the class names are generalized, they divide up how and where these fibers are generally used. Described below are the values obtained from the Japan Carbon Fiber Manufacturers Association (JCMA). A table of varying carbon-based fibers is shown below. Low Modulus carbon fiber is generally not used for structural FRPs. Their low elastic modulus and low tensile strength is not worth the higher price of carbon versus other fibers such as glass. Note that the tensile strengths of High and Ultra-High Modulus fibers are equal to or lower than the strengths of Standard and Intermediate Modulus fibers. Generally speaking, for FRP reinforcement and strengthening of civil structures it’s the tensile strength that is desired. Standard and Intermediate Modulus fiber is generally known as commercial or industrial grade fiber. They have high strength and do not have a very high price tag of High Modulus fibers. The popular carbon fibers used in CFRPs for structure reinforcement and strengthening generally fall into a range of 32,000 to 35,000 ksi (220 to 240 GPa) and tensile strengths between 550 and 725 ksi (3,800 to 5,000 MPa). These fibers give the highest value in terms of tensile strength versus cost. High and ultra-high stiffness fibers are made for the aerospace industry. They are expensive and used in specialized applications such as airfoils. At $900 USD per pound ($1,980 USD per kg) for Ultra-High Mod fiber compared to $25 USD per pound ($55 USD per kg) for Standard Modulus fiber, it's not economical for the civil infrastructure industry. (2010 prices). 2013 Price Update! Costs of standard modulus carbon fiber have gotten as low as approximately $10 USD per pound ($22 USD per kg). 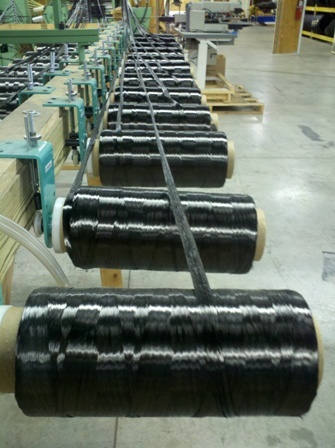 There is a common misnomer regarding carbon and graphite fibers. Although both are very similar in composition, they do not have the same molecular properties. It is incorrect to use graphite fiber as an equal synonym for carbon fiber. Graphite is a naturally occurring soft mineral. Graphite fiber can be manufactured in a process similar to carbon fiber. In the manufacture of graphite fiber, the precursor is heated to temperatures up to 2,800 °C. Graphitization, as this process is called, breaks down the interlocking nature of the carbon ribbons and forms parallel sheets, the most stable form of graphite. Graphitization creates an even more brittle (very, very high elastic modulus) fiber that has low tensile strength. Remember, pure graphite in a flaky or powdery form is used as a lubricant (When I was in Cub Scouts, my dad showed my how to lube the wheels of my Pinewood Derby car with graphite). The molecular carbon sheets or platelets that form graphite are very slippery and slide past one another easily. Graphite has been used as a term relating to carbon fiber in the sports industry. This means that when you’re at the store checking out the latest golf clubs that have “graphite shafts” or fly rods made with “graphite blanks” you’re really looking at products made with carbon filaments. Prince Engineering has provided FRP reinforcement design assistance to engineers and projects in the U.S., Haiti, and Nicaragua. Send Prince Engineering a message regarding your project (This link takes you to the email contact form) or simply call us at +1 (888) 418-2695. We’re inclusive, not exclusive. That means engineering is discussed in a way that’s easy, understandable and productive. You’ll enjoy what you can build with Prince Engineering, PLC.